 This trick might just be able to get you out of a bad situation on the trail. We all know Chris Birch is an off-road god when it comes to riding big bikes in the dirt. But even Chris acknowledges the magnitude of the upcoming challenge where he’ll be racing the 500-pound KTM 1090 Adventure R in the Red Bull Romaniacs, a race that has been dubbed “the world’s toughest Hard Enduro Rally.” And sometimes when we’re under pressure, we come up with our best ideas. Chris had been wondering, what could he do in a situation where he rode off a bank or got stuck on a hill that was impossible to ride the big KTM up. Carrying a portable winch would just add more weight to the bike, making his chances of finishing even less likely. But Chris came up with a ‘trick’ that could get him out of those situations. The idea is pretty simple; start with heavy-duty climbing rope or parachute cord and tie it to a tree or other immovable object. Next tie the other end of the rope to the rear wheel on the rear disc brake side. Start the engine and push the bike up the hill under power with a gentle clutch release, letting the rope wrap around the rear wheel until taught. The rope continues to slowly wind up around the wheel and pulls the bike forward up the hill, just like a winch. In situations where you get stuck in a mud bog, ride off a cliff or you are managing an injury, Chris’s winching technique might just get you out of a hopeless situation. 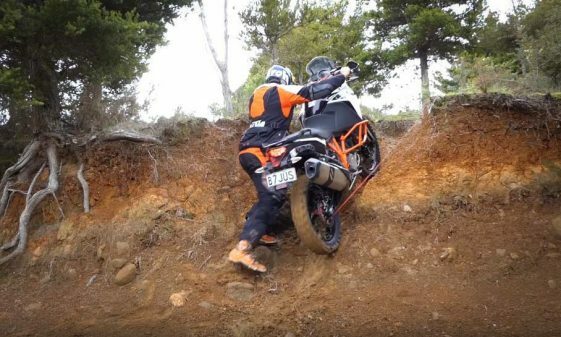 Chris tries out his ingenious technique for the first time in a recent training video and successfully drags his KTM 1090 Adventure R up a test hill. What is not shown is what happened after the bike reached the top of the hill. Did the rope get lodged in the wheel under pressure from the weight of the bike? Chris does admit after the test that there are a few things he still needs to work out. This may not end up being a practical solution for a timed race but the technique just might get you and your bike out of a hopeless situation while out adventure riding. With enough time you could cut out the rope or take the wheel off to untangle it, then be back on your way again. Seems like a nice technique to have in your bag of tricks when things go bad. Would you try it in a pinch? Share your thoughts in the comments! Great info! Absolutely would try it in an emergency! Damn fine idea!!! In a pinch it COULD be a real lifesaver!! Climbing rope is designed to stretch quite a bit under a load to absorb the force of a climber’s fall, so it wouldn’t’t be a good choice for this application. Climbing ropes are also 8-11 mm thick, which is thicker than i would want. The perlon accessory cord that climbers use to set up anchors, etc. does not stretch nearly as much, and is available in thinner diameters. 5 mm accessory cord from PMI has a breaking strength of ~1200 pounds, which should get most motorcycles up some pretty steep stuff. I would save this for emergencies, though. I would also have a sharp knife handy to chop the rope loose from the wheel after I finished. Not all climbing rope is designed to stretch, depends on the type. Static climbing rope does not stretch. 1200 pounds might not be enough, considering you are not putting a static load slowly on the rope. However you will need something with a small diameter, because the “spool” created by break disk and spokes does’t have that much volume. So a full size 12mm static climbing rope might be too thick. The idea is great, need to check that out! Excellent idea! You can also use the rope to start the bike by rolling it around the back wheel and then quickly pulling it. I ve seen that on an AT. Don’t know if will work on other bikes though. Note where the rider is focusing his eyes. He can not see the rope. Note how close the rope is to a hot exhaust. You get my point. Still, yeah, looks useful. Wouldn’t this end up bending the rear brake rotor? No one else has commented on it, and he didn’t seem concerned. Am I missing something? Or….since you’re adventure riding….you could have one Warn X17 winch with a power lead on all 4 bikes so no matter which one goes over the bank you can still power the winch to pull the bike out. What a great idea. I wonder who thought of that? a old 4X4 trick. it does work. and no mater what you get to do after. this can get you unstuck. Great job! Very interesting article! Nylon rope snaps, severs leg. Why show people this??? Probably better to use a static (non stretch) rope rather than a dynamic (climbing) rope. Less chance of the rope over tightening due to the stretch – should be somewhat easier to remove from the wheel after. I have used that same trick on snowmobile tracks to get them up steep stuff. This is too complicated . A better way is three or two fat friends . Technique – tie the rope to your bike – a bowline is ideal. Rope around the tree or other structure at the top of the slope . At the other end of the rope tie three handholds for your fat friends – actually they don’t have to be fat . But fat (weight)is your friend in this situation . For the handholds a alpine butterfly knot is best , this is the only knot you can tie in the middle of a rope that won’t jam . Google alpine butterfly knot . I used this technique to get myself and a colleague pushing a suicidal women in a wheelchair up a very steep slippery slope . The weight on the other end was her sister who could be described as well feed . However her weight moving downhill was enough to move all three of us up this slope . No sweat !! Is there any chance that the rope might get to tight around the spokes and maybe brake the spokes, or bend them? It is a great idea!